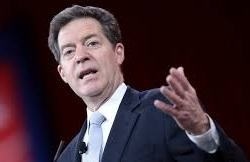 WASHINGTON, Jan. 25, 2018 /Christian Newswire/ -- The Senate confirmed noted human-rights champion Sam Brownback today as the new Ambassador-at-Large for International Religious Freedom. Ambassador Brownback will head the State Department's Office of International Religious Freedom that monitors religious freedom abuses throughout the world. He is the first ambassador under the revised Frank R. Wolf International Religious Freedom Act, the passage of which affirms continued congressional commitment to international religious freedom as a foreign relations priority. With roughly 80 percent of the world's people living in countries with high levels of religious oppression, it is a critical time for international religious freedom. In Burma, Iraq, China, and Nigeria, among other countries, Brownback's diplomatic experience will be crucial in the months ahead. "International religious freedom is one of the few, truly non-partisan issues in Washington, both fundamental to our identity as Americans and also essential to our national security," said 21Wilberforce Senior Fellow Frank Wolf. "In Sam Brownback, we have a leader who not only understands the intricacies of Capitol Hill, he has a heart and the demonstrated passion for the mission of this office." While in Congress, Brownback was a Senate leader on international religious freedom, advocating for landmark policy reforms, both domestically and abroad, as well as for prisoners of conscience wrongly incarcerated for their faith. He led the effort to enact the Trafficking Victims Protection Act of 2000 which was central to the movement to combat human trafficking. Brownback was actively involved during the Darfur crisis. His travels to that embattled region compelled him to push for a genocide declaration in 2004. He introduced numerous pieces of key human rights legislation, including on North Korea and also Sudan, where he called on the Sudanese government to end slavery, "manufactured" famines, and civilian bombings. Brownback chaired the Senate Foreign Relations Sub-Committee on Near Eastern and South Asian Affairs and co-chaired the U.S. Helsinki Commission. The Ambassador-at-Large for International Religious Freedom post was most recently held by Rabbi David Saperstein. 21Wilberforce President Randel Everett noted, "Ambassador Saperstein's leadership has been an invaluable asset and he has furthered the cause for religious freedom around the globe." When Saperstein was asked about Brownback's support for international religious freedom he responded "It's an issue he knows, he knows well and cares deeply about."